Edgar has one of the best jobs in the town. He can work indoors, outdoors, come rain or shine. He doesn't need a fire, and the materials can be acquired for almost nothing. Skeletal material such as bone, antler and horn were widely used before the advent of modern plastics. The qualities of these organic materials are such that their use survived until the beginning of the 20th century, making it quite difficult for the producers of plastics to persuade the public to purchase this new substance. The last and most widespread use of bone in recent years was for the handles of sets of cutlery, though even these have now been replaced by plastic. Edgar had no such problems. Almost any animal over a certain size is a moving repository of unworked material. Anything that carried horns or antler was an extra bonus. His only problem was persuading people to respect his business and not crack open the large bones to get at the marrow within. After the dispatch of an animal, it was hung up and its blood drained. The hide was then recovered as the butchery process went on. All the meat products were cut off leaving just the bones as the only suggestion that the carcass was once an animal. It was once said of a pig that only it's 'squeak' was left unused. That is nearly true. In most cases the skull, spine and tail were discarded , since they were not particularly useful for Edgar. The lower jaw, shoulder blades, leg bones, ribs, and pelvis were all very useful, and this applied to most animals. The next part of the process was to rid the remaining bone of any fatty deposits. This can be done in a number of ways. Cooking is a good method and also provides added sustenance via the bone and marrow, if the ends are cut off carefully. The other is to bury the bone in a shallow pit to allow the microbes and creatures in the soil to strip the bone clean. Wood ants are another helpful part of the team, although only a few bones can be placed in any one nest. The buried bones need to be sufficiently deep to prevent foxes and other local dogs from digging them up and carting them off. A dog will clean the bone, but will also do irreparable harm to it as well, which will invariably be just in the wrong place. Edgar uses a little of each, and sometimes just leaves them to overwinter. He uses the ants nest for the finer bones like those from goose or swans wingswhich are used for making into whistles. Horn was also collected after the animal had been slaughtered; whereas antler could, but was not always gathered in the early spring from the woods and adjacent fields after the males that had cast their antler. It couldn't be left too long, as the deer and many other animals would chew the antler to reingest the calcium contained within it. Edgar doesn't get his bone from his neighbours for free. They insist that there is a fair trade for the bone and horns. On occasion, his own animals help to pad out his reservoir of materials. And it won't be the first time that a customer has turned up with a heap of bones and asked for an object to be made from them, hoping for a very reduced rate. Edgar is not such a push over. Quality materials are important, just like with any other job. Bone is good for carving and is very good when only bent or forced in one direction. This makes it ideal for buckles for example, but not strong enough for combs. Riveting through bone is more tricky than it is with antler or horn, although bone will give you fairly thick plates of material where antler can be disappointing. This means that buckles, thick pins such as cloak pins, plates for panelling wooden game boards or complete boxes are made from bone. Skates and whistles are made of bone because of its naturally strong tube shape. Antler has a soft core of tissue, which will be full of blood if it comes from a slaughtered animal; but will be clean and easily drilled out with nothing more than a long thinnish strip of iron if it is a cast piece. Its complex shape makes it unpredictable and difficult to judge until it has been cut. Only then can you sort the good from the less useful pieces. 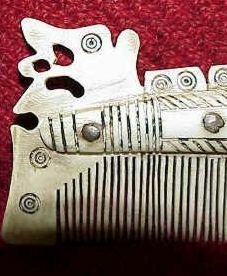 A close up of the teeth on a comb. You can just see file marks and scratches on the antler that give a clue as to how it was made. Combs were regularly made from antler, as its more grainy structure allows it to be cut into thin strips without the likelihood of it snapping. The teeth in the combs are testimony to this. It is only thick and solid at its base next to the skull, and from here dice or playing pieces were cut. The soft tissue in the centre of the cut antler, will compress around the tang of a knife, making it an ideal material for making handles for various tools and weapons, as well as everyday knives. He always finishes the antler on a handle, so that none of the brown 'bark' on the outside is left. This is then either polished or engraved with a pattern. He never uses bent or crooked sections of antler either, preferring straight grips on all the knives. Horn - apart from its obvious use as a drinking vessel - has to be cut and pressed using heat and pressure to make it flat. If it is white horn it can then be split, to make quite thin sections for use as a form of window glass in lanterns. Horn will remain flat if not heated again, when it will try to regain its former shape. 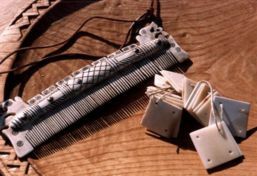 Liturgical combs are often made of horn, as are tablet weaving plates. It can also be used for handles of knives if two pieces are plated and glued together either side of the tang. The one material he doesn't get often enough is ivory. This makes it very expensive, and he worries over cutting it and making a mess of the job. He isn't too sure about where it comes from, as all he ever gets are the remains of a skull with some very large teeth in it. Often the skull is missing too. This ivory all comes from the Walrus, and is hunted off Greenland and in the Arctic Circle. It is the only material he gets which is entirely solid and some tusks are nearly three inches thick and over two feet long. However, Edgar is not the only person who cuts and carves their own bone into useful objects, but he is the only one in Wichamstow who gets paid to do it. 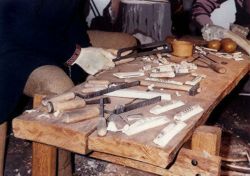 'Bone and Antler working' - An article on bone and antler working. Last updated 25 March, 2005 . Article by Roland Williamson 2000 .